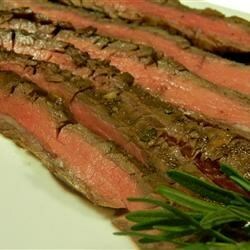 "Flank steak is a perfect grilling meat. It's marbleized with fat that melts while grilling and fills the meat with the flavor of natural juices. If you have a lot of marinade leftover from this recipe, save it in your refrigerator and use it to marinate other grilled meats or chicken; it will last up to one week." Cook steak until firm, hot in the center, and just turning from pink to grey, 6 to 8 minutes per side, brushing occasionally with reserved marinade. An instant-read thermometer inserted into the center should read 150 degrees F (65 degrees C). Remove steak to a cutting board and rest meat 5 minutes before slicing thinly across the grain. See how to make flavorful flank steak with grilled oranges. If you wish to serve extra marinade with the finished beef, pour marinade into a small saucepan and bring to a boil over high heat. Reduce heat to medium-low and simmer 10 minutes. This was a very flavorful marinade. The london broil came out very tender. I didn't add any salt because the soy sauce is salty enough for us. This will definitely be in the rotation! We did not care for the balsamic and mustard flavor. Prefer the Flank Steak Willyboy recipe. AMAZING! Made exactly as recipe called for. I let it marinate for 7 hours and the flavor was delish! The hubby said one of the best steaks he has ever had. WONDERFUL WONDERFUL WONDERFUL! Did this exactly as written, marinated for 24 hours and we'll do this again over and over without changing one thing! Loved this recipe. Only had time to marinade for 30 minutes and it was delicious! Want to try it again with more marinating time. This is a keeper. Used Pomegranate Balsamic Vinegar as it was all I had on hand. Wasn't crazy about the taste of the marinade, but let the steak marinate in the fridge for 2 days. Really like the results.